Had a really great time making some new woodcut prints. This was my first time experimenting with woodcutting. It's such a wonderful process and I'm happy to have explored some initial experiments. Looking forward to doing some more on my own. 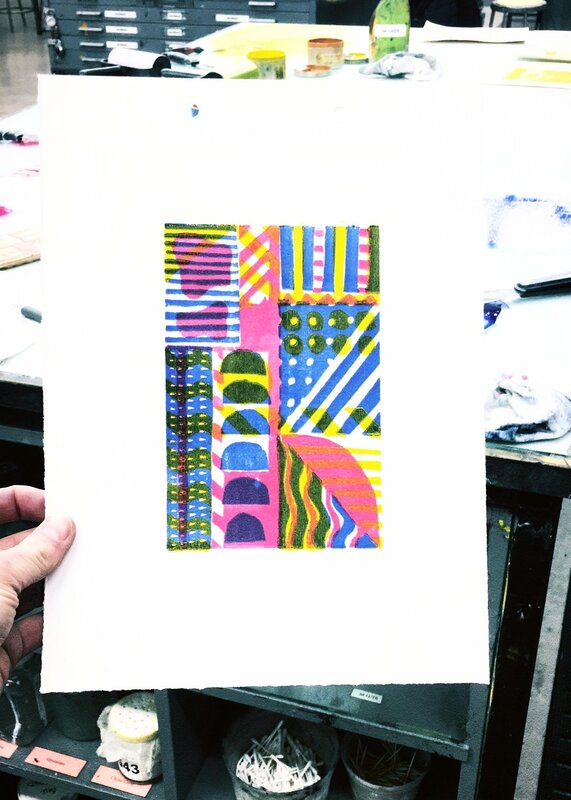 These were created at the Minneapolis College of Art and Design printshop. Loved playing with color, shape and transparency overlaps. My final was a small 3 layer print. By using transparency with the magenta, yellow and blue, the overlapping shapes brought out some secondary colors. They are far from perfect but thought the process was so fun. After I got my first layer done and tested (the top/last printing layer, which is the blue)—I carved and continued to plan the rest of the print. I didn't have anything in mind but just started sketching and imagining ideas of these different shape layers interacting. The initial planning took a bit to wrap my head around what to carve so I used tracing paper to plan out color and carving. I realized that unlike some other recent printmaking explorations, like monotypes especially, there is a lot of prep work and planning before you start on press. I only ended up with 12 final prints, but know i don't need any more extra prints lying around here. I recently did a giveaway on Instagram to hand some of these off. The rest I might just hang on to or offer for sale. I have two more empty woodblocks and all the right tools and paper to print at home. (More work to print without a press, but very doable!) Hope to continue to play more soon!